The Ghost Train is a 1941 British mystery thriller film directed by Walter Forde based on the 1923 play of the same name written by Arnold Ridley. Tommy Gander (Arthur Askey), a vaudeville comedian, pulls the communication cord on a GWR express train, bringing it to a stop so he can retrieve his hat. 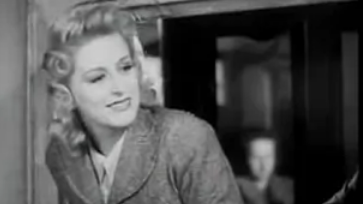 Returning to the train, he escapes an angry conductor by ducking into a compartment occupied by attractive blonde Jackie Winthrop (Carole Lynne), with whom Gander flirts. Another passenger, Teddy (Richard Murdoch), has his eye on Jackie as well, but her companion Richard Winthrop (Peter Murray-Hill) ejects both of them from the compartment. When the train stops at Fal Vale Junction, Cornwall, these four get off to change trains, as do Herbert (Stuart Latham) and his fiancée Edna (Betty Jardine), spinster Miss Bourne (Kathleen Harrison), and the tippling Dr. Sterling (Morland Graham). However, the stationmaster, Saul Hodgkin (Herbert Lomas) tells them the last Truro-bound train has gone, and that they cannot remain at the station, as he is locking up for the night. The passengers insist on staying, as it is raining heavily and the nearest village is four miles away. Hodgkin warns them the station is haunted. A branch line once crossed the river on a swing bridge close to the station. One night 43 years ago, then stationmaster Ted Holmes had a fatal heart attack while attempting to close the bridge, causing a train to plunge into the river. Ever since, a phantom train has been heard periodically on the abandoned track. It is said to kill anyone who looks upon it. With that, he reluctantly leaves them. As the passengers make themselves as comfortable as they can, they hear footsteps outside. Richard opens the door, and Hodgkin collapses into the room. Dr. Sterling pronounces him dead. Later, a terrified young woman in black (Linden Travers) appears. She, Julia, pleads for help, saying that someone is pursuing her. A car spins off the road and crashes into a tree. The driver is unhurt, but his car is damaged. Back in the waiting room, he introduces himself as John Price (Raymond Huntley) and explains that he is searching for his sister Julia, who he says suffers from delusions. Julia protests that he is lying. Price further explains that she thought she had seen the ghost train, and became obsessed with it ever since. The passengers tell him that Hodgkin has died. When Price insists on seeing the body, they discover it has mysteriously vanished. Price leaves to arrange transportation. Then an approaching train is heard. As it thunders past, Julia smashes a window to look at it, then screams and faints. They hear singing from the nearby railway tunnel mouth. Julia claims that Ben Isaacs (D. J. Williams), the sole survivor of the accident, is coming back. Teddy shoots at the “ghost”, causing it to flee back into the tunnel, leaving behind a bloodstained cloth. Teddy shows the others the cloth and orders the others, at gunpoint, to stay put until the police arrive, but Richard punches him, knocking him out. The passengers carry him to the bus Price has obtained. When Teddy comes to, he is furious with Richard, as now there will be no one to intercept the train on its return journey. When Gander remarks that he had returned the bridge to the open position, Dr. Sterling suddenly orders the bus driver to stop, while his confederate, Price, produces his own gun. Sterling orders the driver to turn back so they can warn the train. Meanwhile, guns are being loaded aboard the “ghost train”; a very much alive Hodgkin flags the train off and climbs aboard. Teddy explains that the train is really being used by Nazi Fifth Columnists to secretly transport arms. While Price heads down the embankment with Julia and the driver to try to stop the train, Teddy knocks Sterling out and gains control of the situation. The train plunges into the river.